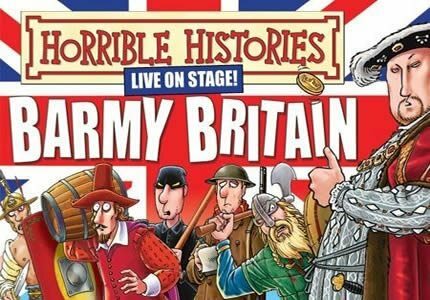 Back on stage with Barmy Britain Part Three following the success of Part One and Two, Horrible Histories are live on stage once again bringing British history alive for children once more. Fans of the bestselling books and the BAFTA Award winning television show will delight in historical chaos being brought to life in the theatre as the Horrible Histories team playfully explain history with all the gruesome details left in! Horrible Histories : Balmy Britain Part Three sees King John, King Charles, Admiral Nelson, the Duke of Wellington and figures from the First World War. The period of history covered zooms through from the 12th to the 20th Century. Directed by Neal Foster, who also stars in the show alongside Anthony Spargo, the show is produced by the Birmingham Stage Company. The show uses fantastic costumes, props and puppetry to tell many of the nation's greatest historical tales in a way that will capture the imagination of young children. Horrible Histories runs during the day at the Garrick Theatre from the 25th of July until the 5th of September, so perfect for the school summer holidays. Horrible Histories: Barmy Britain Part Three is absolutely suitable for children! The entire Horrible Histories franchise is aimed at bringing historical information to children in a way that they can enjoy and engage with. The show running time is only an hour, so perfect for smaller children’s attention spans.